The Chinese version is hard enough to make sense of, but the Japanese wording is even more opaque. Here are some attempts by befuddled Japanese specialists to grapple with it. The term doesn't exist in Japanese. It would be 菌王醤 (same as the Chinese), which is just a kind of mushroom sauce, right? 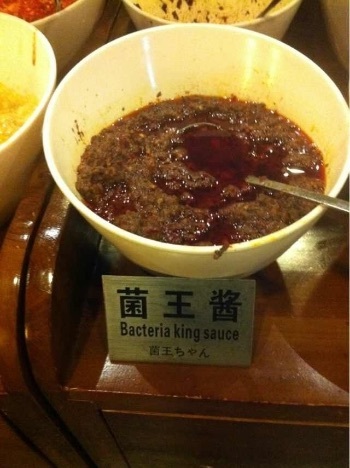 I have never heard of this sauce in Chinese, English, or Japanese. So, if anything, it should be written 菌王ソース. I am not sure, but something like 'little powerhouse bacty'? It seems that machine translators, and untutored human translators as well, have a strong preference for "bacteria" over "mushroom; fungus" for jūn 菌, even in cases where the reference is clearly to an edible fungus. The problem could be avoided if menu and recipe writers would use the disyllabic word mógū 蘑菇 / 磨菇 ("mushroom") more often instead of jūn 菌 ("bacteria; fungus; mushroom"), but somehow the monosyllable jūn 菌 sounds more elegant to many of those who are charged with writing menus and food books (not to me! — I prefer the vernacular flavor and clarity of disyllabicism). 醬 is actually the Chinese (slang) loanword for ちゃん, so it's entirely possible that machine translation picked up on the connection and reversed it. Not to be indelicate, but looking at the contents of that bowl leads me to a sneaking suspicion that the English may be more accurate than the Chinese. The one in the picture is the second, simplified one, not the first, traditional one. The third is the variant usually used in Japan. In the other direction, 醬 is usually rendered ジャン　/jaN/ in recent loans from China/Korea, such as 豆板醤 /to:baNjaN/ and コチュジャン /kochujaN/ (which I believe is originally 苦椒醬). The more common Japanese reading of 醤 is its kan-on reading /sho:/ as in 醤油 /sho:yu/, soy sauce.